Families experiencing homelessness often spend a lot of time in the waiting rooms of health care facilities, and parents are often overwhelmed by navigating the system that provides necessary services. So by the time you’re offering your services, both little ones and parents can be struggling, making it hard to remain receptive and optimistic. You can make this pre-visit time a little easier by helping parents and children relax together. 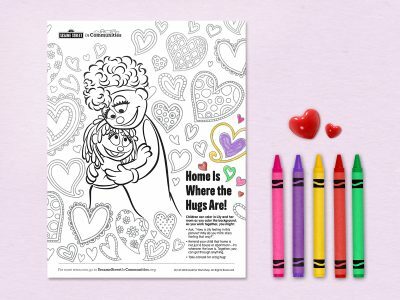 Print, copy, and set a stack of these collaborative coloring pages out in your waiting area with crayons and colored pencils. When families come into your office, you might ask to see what they’ve done or use it as an ice breaker or conversation starter (check out the tips at the bottom).